The goal of this article is to help people interested in learning how to use PowerShell Desired State Configuration (DSC) to configure their SharePoint environment get started. While it is totally possible for you to configure a SharePoint Farm on an environment that has PowerShell 4.0 installed on, it is our recommendation that you try to use PowerShell 5+ as much as possible, as it offers a lot of improvements on the DSC side. The example covered in this article will be a Single Server SharePoint 2016 farm deployed with SQL Server 2016, on Windows Server 2016. We will be using DSC in push mode, meaning that we will manually execute the Start-DSCConfiguration cmdlet on the environment, and will ensure all dependent DSC Modules are put on the server prior to attempting to configure it. Install the SharePoint 2016 Security Update (KB3115299); This update needs to be extracted in the updates folder of the SharePoint installation (slipstreamed). The binaries to install SharePoint and SQL Server will be put on a Shared location, to which our Virtual Machine will have access to. Also, the Security Update (KB3115299) is required for the farm to get properly configured. Without it, you will get the following error thrown when calling the SPFarm DSC Block (at the New-SPConfigurationDatabase step): An error occurred while getting information about the user sp_farm at server contoso.com: The RPC server is unavailable. This installation will be slipstreamed within the SharePoint 2016 installation binaries. In this section we will cover the various prerequisites that have to be in place before initiating the DSC configuration. The SXS folder contains the /Sources/SXS content from the Windows Server 2012 R2 installation media. It contains files that are required by the Prerequisites installer to install the .NET 3.5 components. During the DSC process, the SXS folder will be copied from the Remote Network Share onto the local disk. This is required for the Windows Feature to be properly installed on the local server. Also, it is important for you to extract the Language pack in the specified folder. By default, when you download a SharePoint language pack, you get a file called serverlanguagepack.exe, however that won’t work with SharePointDSC. In order to properly extract its content you need to run the following command: .\serverlanguagepack.exe /extract:path. This will generate the folder structure expected by SharePointDSC. The steps to get these properly installed on your server will differ depending on whether or not your Virtual Machine has internet connectivity or not. If your Virtual Machine doesn’t have internet connectivity, then you will have to manually copy the required modules inside the PowerShell modules repository. The easiest way to do that, is to download all the required module from a machine that has internet connectivity (see section just above), and then copy the downloaded modules manually onto the server. When you call the Install-Module cmdlet, PowerShell actually installs the specified module in C:\Program Files\WindowsPowerShell\Modules. Simply make sure you copy all the folders from that machine that has internet connectivity and from where you executed the Install-Module cmdlets, over to your SharePoint Virtual Machine, under the same path. By default, the network share won’t be recognized as a trusted location. If you were to navigate to it from your SharePoint server and try to execute a program from it, you will get prompted with a Security Warning prompt that allows you to trust the file. 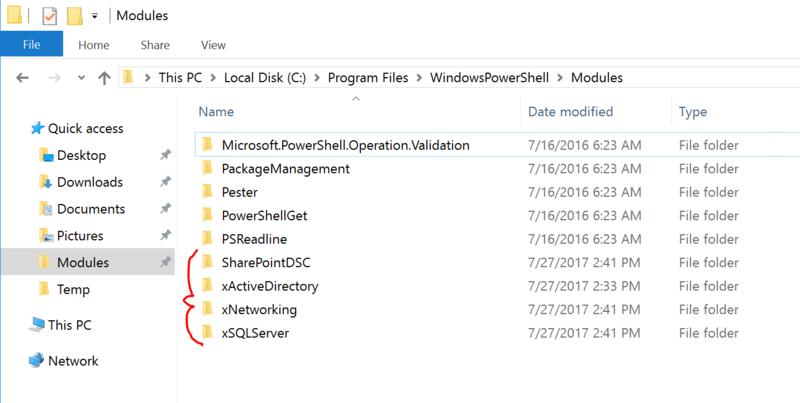 PowerShell DSC is faced with the same issue in the background and this actually causes the process to hang. In order for PowerShell Desired State Configuration to be able to properly execute remote executable such as the SharePoint Prerequisite Installer, you need to add your network share to the Intranet zone in Internet Explorer. Simply launch the IE options, switch to the security tab, select Intranet, click on Sites and add the path to your network share (in my case file://dsc-share). You will also notice that at the bottom of the screen there is a section that will automatically compile a Meta-Mof file to configure the Local Configuration Manager (LCM) process on that machine so that it will automatically reboot the server when needed (prerequisites, domain-join, etc.) and automatically pickup the configuration where it left it upon being restarted. $Script:FarmAdmin = Get-Credential -Username "contoso\sp_farm" -Message "Farm Admin"
$Script:FarmDomainAdmin = Get-Credential -Username "contoso\administrator" -Message "Domain Administrator"
InstallSharedDir = "C:\Program Files\Microsoft SQL Server"
InstallerPath = $AllNodes.SharePointBinaryPath + "\prerequisiteinstaller.exe"
SQLNCli = $AllNodes.SharePointBinaryPath + "\prerequisiteinstallerfiles\sqlncli.msi"
DOTNETFX = $AllNodes.SharePointBinaryPath + "\prerequisiteinstallerfiles\dotNetfx45_Full_setup.exe"
NETFX = $AllNodes.SharePointBinaryPath + "\prerequisiteinstallerfiles\NDP453-KB2969351-x86-x64-AllOS-ENU.exe"
Sync = $AllNodes.SharePointBinaryPath + "\prerequisiteinstallerfiles\Synchronization.msi"
AppFabric = $AllNodes.SharePointBinaryPath + "\prerequisiteinstallerfiles\WindowsServerAppFabricSetup_x64.exe"
IDFX11 = $AllNodes.SharePointBinaryPath + "\prerequisiteinstallerfiles\MicrosoftIdentityExtensions-64.msi"
MSIPCClient = $AllNodes.SharePointBinaryPath + "\prerequisiteinstallerfiles\setup_msipc_x64.exe"
WCFDataServices56 = $AllNodes.SharePointBinaryPath + "\prerequisiteinstallerfiles\WcfDataServices.exe"
KB3092423 = $AllNodes.SharePointBinaryPath + "\prerequisiteinstallerfiles\AppFabric-KB3092423-x64-ENU.exe"
MSVCRT11 = $AllNodes.SharePointBinaryPath + "\prerequisiteinstallerfiles\vcredist_x64.exe"
MSVCRT14 = $AllNodes.SharePointBinaryPath + "\prerequisiteinstallerfiles\vc_redist.x64.exe"
ODBC = $AllNodes.SharePointBinaryPath + "\prerequisiteinstallerfiles\msodbcsql.msi"
Url = "http://" + $AllNodes.NodeName + "/sites/searchcenter"
If you pay close attention to the last line of the script above, you’ll notice that upon calling our DSC Configuration’s name (in our case SPStandAlone), that we are passing it a path to a .psd1 file for the -ConfigurationData parameter. This basically tells PowerShell Desired State Configuration that it needs to read the variables contained in that .psd1 file in order to properly compile itself. That PowerShell Data File (.psd1) is where we will specify all of the variables for our environment. This allows us to keep the .ps1 script generic so that it can be used to generate 100’s of Virtual Machines having the same configuration without having to modify it for each one. We simply need to modify the .psd1 file in order for the changes to be picked up upon the MOF compilation job. In our example, we will be specifying the following content in our .psd1 file. Note how the script above is accessing each of these variables by using $AllNodes.<Variable>. This $AllNodes is a reserved keyword that allows us to access values in the ConfigurationData of any given DSC configuration script. You could also expand the .psd1 to include variables unique for a specific node, if your DSC script node ever defined more than one node (like it should be the case for most SharePoint farms). 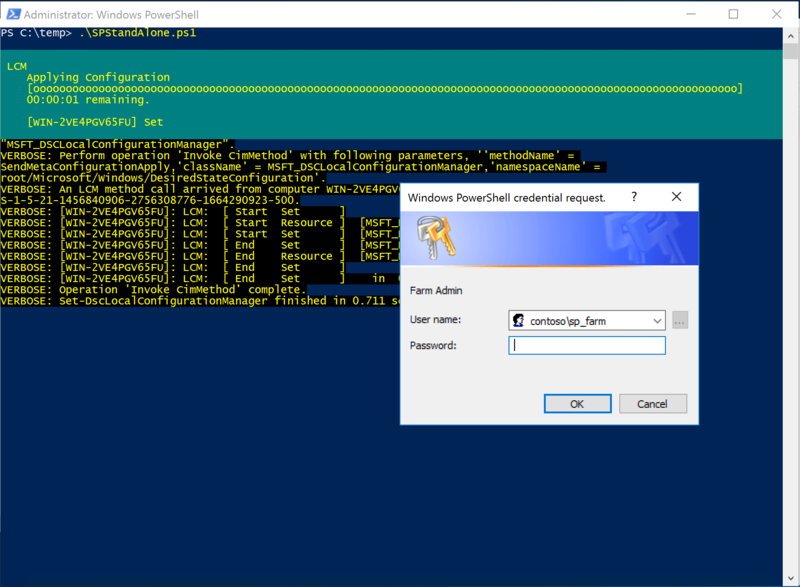 This section describes the steps you need to take in order to initiate the deployment and configuration of your SharePoint 2016 Farm using the PowerShell Desired State Configuration scripts above. 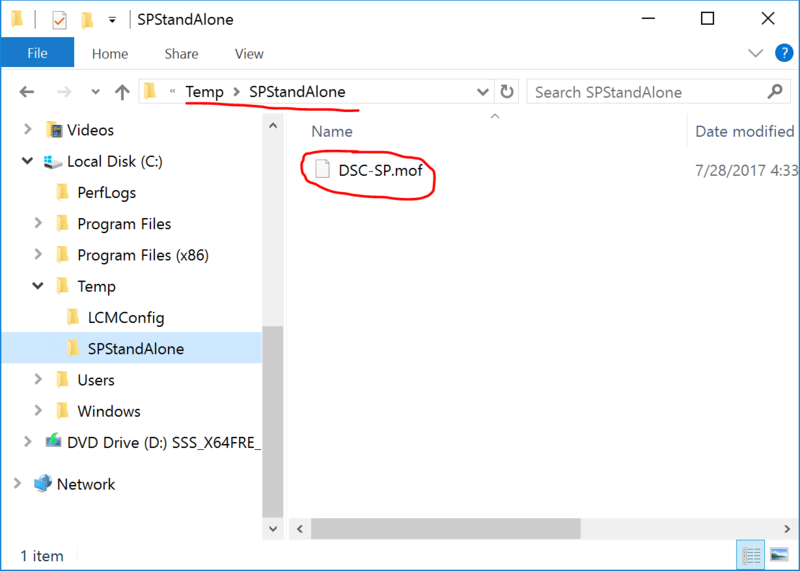 Copy both the SPStandAlone.ps1 and SPStandAlone-ConfigData.psd1 file onto the SharePoint server. In my case, I put hem both under C:\temp\. Open a new PowerShell console as an administrator and browse to the directory where you’ve copied the 2 files. Execute the SPStandAlone.ps1 script and provide both the SharePoint Farm Admin and Domain Admin credentials when prompted. Even though this user doesn’t yet exist, the credentials you provide here will be used to create the account in Active Directory. Your .MOF file has now been generated in a new folder named by our Configuration (SPStandAlone). 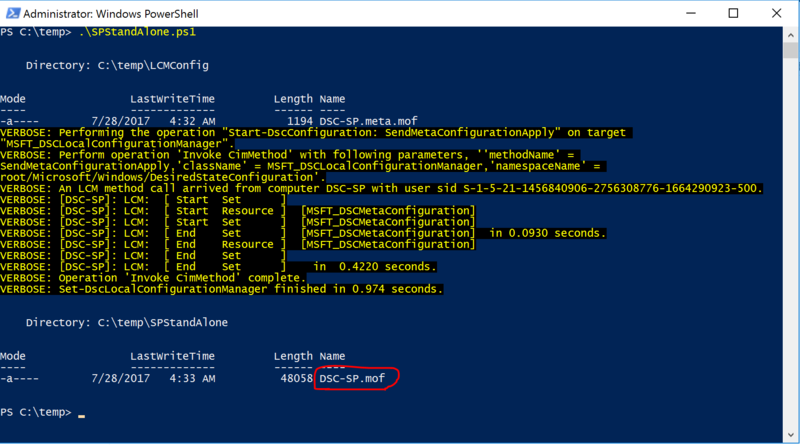 The server will automatically reboot several times, and upon rebooting, you will loose the verbose PowerShell console, but don’t worry DSC is still being executed in the background. If you need to check the DSC execution logs, simply open Event Receiver and navigate to Applications and Services Logs > Microsoft > Windows > Desired State Configuration > Operational. After about an hour or so depending on the performance of your environment, you will have a fully working SharePoint 2016 Standalone machine. System.Exception: Test-TargetResource returned false after calling Set-TargetResource. 1. The prereqs were not installed automatically. The mounted media did not had the same structure of prereqs. In the “prerequisiteinstallerfiles” folder I did not see the structure of what was described in the script. I had to install the prereqs manually. 3. One thing I noticed and perhaps why Nik has suggested the binaries be in a shared folder, I mounted them to my E & F drive but after the server rebooted, the E & F were gone and I had to run the script again manually. Overall, I think it is a great addition to SharePoint and I can see clients getting significant benefit of this. 1- You need to manually download the prerequisites files and drop them in the pretequisiteinstallerfiles folder your self. You can refer to http://nikcharlebois.com/installing-the-sharepoint-2016-prerequisites-offline-using-powershell/ to get a full list for windows server 2016. Really good stuff, liked the MVA training sessions as well. Just wanted to comment that I had a similar issue with Language packs, in that I have 33 of them to install. Didn’t find an easy way to handle that, and extracting each one to the folder overwrites the previous one since they all have the same file names like “Setup.exe” , “osmui.msi” etc. I ended up just scripting my installations, and I found that downloading the language packs from MSDN gives you uniquely named exe files for each language, so much better than the “serverlanguage.exe” experience. Everything went great then just be aware that the installation goes to the default directory, so if a different install path is desired you can find the parameters on the wiki, as I did. Thanks for your input. Yes there is that case where all files have the same name which can be problematic. This can be solved by create a unique folder for each Language Pack and by including multiple SPInstallLanguagePack DSC Resource, which is not pretty. Can you elaborate a bit more regarding what it is you mean by it goes to the default directory? The example uses BinaryDir to specify the network drive location specified in the ConfigurationData. Is that what you are referring to? thanks for taking the time to follow up. I will try and send you my DSC file for multiple language packs, but I suspect since I tried it and I couldn’t get it to work I have something wrong. On your question about the default directory I was talking about the SharePoint installation. Just wanted to make it known that you have provided us the means to control that path with the DSC variable “InstallPath” in our configuration / MOF file. I found that out by actually reading thru the resources on the wiki. My comment about it was simply an encouragement for others to read thru the resources on the Wiki to find all the nice things you have already done for us. Thanks Nik for such a nice blog. It helped a lot. Also thank you very much for your support. I receive an error saying “Farm is Unavailable”..
Can u please help here? SharePoint_Installation -ConfigurationData $ConfigData # Close the Configuration with the Name. Since this is for a StandAlone to start with I just have one account which is a FarmAdmin and using the same to create the Farm and Configure with the Service Applications. How can you specify the MinRole configuration in the ps file, currently the file shows standalone deployment. Does it support multi server farm deployment as well. I need to specify the WFE’s, APP , Search servers.